In 2016, master space opera writer writer Alastair Reynolds delivered something decidedly different in Revenger. With all of his usual hallmarks – deep world building, fascinating backstory and engaging characters – Revenger was a futuristic pirate tale complete with buried treasure, dread pirate captains and plenty of swashbuckling. The story was of two sisters who run away to join a privateer and are then separated when the legendary pirate Bosa Sennen attacks, and of the subsequent mission by one, Arafura, to find and rescue the other. For those who have not read Revenger, the rest of this review will contain spoilers. As the book opens, Fura and Adrana are on the run with their remnant crew on board the ship of the former evil pirate Bosa Sennen. They are low and fuel and the opening scenes have them raiding a “bauble”, one of this universe’s ancient treasure troves, for supplies and encountering traps and dangers. Following this they are forced to find a settlement where they can treat their wounded and buy supplies. Here they run into more trouble and a powerful crime lord while Fura pursues a secret agenda. Shadow Captain does not have the rattling plot of its predecessor. It feels like all style, with a few character beats, but very little substance. The characters move around but with little purpose, the secrets that they end up revealing do not land with any force and do not make the journey to get to the answers feel worthwhile. While readers get a tiny glimpse, this book fails to expand the universe much further than that revealed in Revenger. 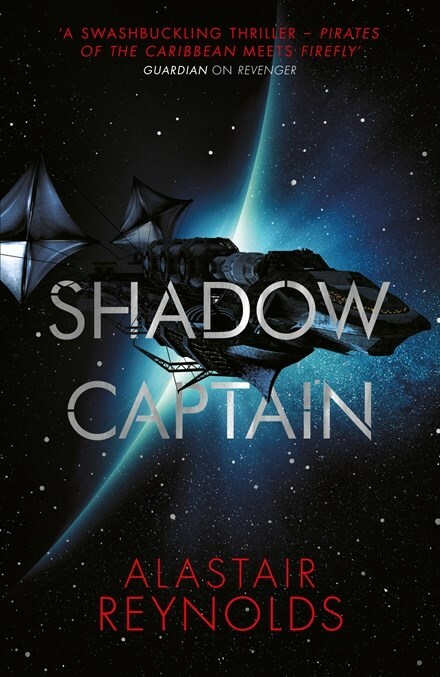 If anything, Shadow Captain makes this universe feel more mysterious and less well known. And by the end, the whole feels like an overlong setup for a third book in which, if readers still have the patience, some secrets may be revealed.